Refrain from smoking at all costs. 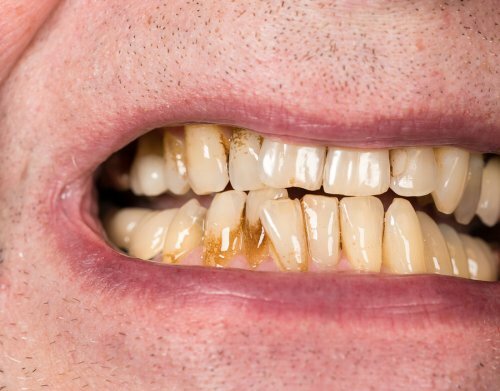 Smoking cigarettes is detrimental to your overall and dental health, but it causes severe yellowing and browning of the tooth enamel. Avoid sugary and acidic drinks. Energy drinks, sports drinks, sodas, and juices contain a lot of sugar and acids that break down your teeth’s enamel. As the enamel breaks down, your teeth become more vulnerable to staining bacteria. Avoid coffee and wine. If you continue to drink them, then limit your consumption and use a straw. This will reduce how much liquid impacts your front teeth. Eat staining foods—such as blueberries and blackberries—in moderation. These fruits are high in nutrients, but the pigmented juice can cause teeth staining. Maintain effective dental habits, such as brushing your teeth twice each day. This will prevent teeth staining and gum disease.